Geologic maps display the arrangement of geologic features of a particular area. These features can include such things as types of rocks, faults, minerals, and groundwater. From studying a geologic map the user can better understand possible dangers like the potential for floods or earthquakes, and help locate important deposits of energy resources, such as water, oil, natural gas, and minerals. Through the use of letters, colors, lines, and symbols, geologic maps help the user gain a better understanding of Earth's makeup. Geologic maps use color to represent various types of geologic features or units (a particular type of rock with a known age range). Geologic units are indicated by colors that can range from yellows and reds to purples and browns. Not only are geologic units assigned a color but also a set of letters. The set is usually composed of an initial capital letter followed by one or two lowercased letters. The capital letter represents the age of the geologic unit. The lower-cased letters indicate the geologic unit's name or the type of rock of which it is comprised. Contact and fault lines. When two geologic units are located next to each other, the place where they meet is called a contact. The two main types of contacts are depositional contacts and faults. Depositional contacts are created when geologic units are composed under, over, or next to each other. The place where they meet is called a depositional contact and is indicated by a thin line. Geologic units can be moved over time by faults. Faults are cracks or fractures in Earth's crust (outer portion of Earth's surface) caused by the movement of land masses, called plates, on either side of the fault line. When plates move suddenly, the result is an earthquake. A fault line (a thick line with the same geologic unit on both sides of the line) indicates geologic units that have been moved by faults after they have been formed. Fault lines are especially important for geologic maps of a state such as California, where faults are known to be active. Bed: Mass of rock that extends under a large area and is bounded by different material. Fault: A crack running through rock that is the result of tectonic forces. Fold: A bend in a layer of rock. Fold lines. Over time, geologic units can be reshaped by Earth's movements into wavelike shapes called folds. (A fold is a bend in a geologic unit that forms due to a change in pressure). Wavelike folds are composed of layers of Earth's crust that bend and buckle under enormous pressure as the crust hardens, compresses, and shortens. Folds may be softly rolling or severe and steep, depending on the amount of pressure and density of the crust. Folding may be massive, creating mile upon mile of mountains like the Appalachian chain, which traverses the eastern United States from New York to Georgia. A fold axis (a line that follows through the crest, or peak, of a fold) is represented on a geologic map by a line thicker than a depositional contact line. 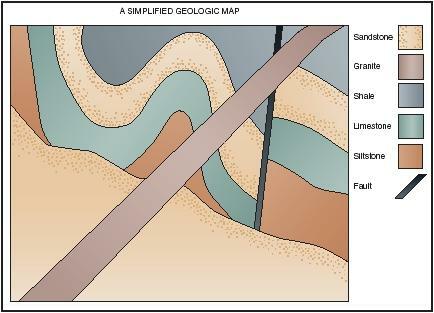 Lines on a geologic map can be adjusted according to known or unknown locations. When a contact line is indicated but the location is not quite certain, the line will appear as dashed. As the dashes that make up a line become shorter, the more uncertain the location is to establish. This could be due to man-made construction or natural growth of vegetation. If the line appears dotted, the location is very uncertain. Other, more specialized symbols are often used as well on geologic maps to help the user understand the makeup of Earth below. crust). The result is that the bed is tilted. To identify such a bed on a geologic map, a strike and dip symbol is used. The strike and dip symbol is composed of three elements: a long line, a short line, and a number. The strike line is represented by the long line and indicates what part of the bed is still horizontal. The next line, the short line, is called the dip line and indicates which way the bed is tilted. The number, called the dip, follows next and indicates in degrees how much the bed is tilted. The higher the number, the more sharply the bed is tilted. Map key. To help the user understand a geologic map, a map key is always provided. A map key is a table that displays all the colors and symbols used on a map. Starting with the most recently composed geologic unit and preceding to the oldest, a description of the type of rocks and their age are listed next to the color that represents them on the map. Following the list of geologic units comes another list of symbols, such as different types of lines, and then the strike and dip marks. If necessary, a map key also contains other important information, such as the locations of fossils, deposits of precious metals (such as gold, silver, and platinum, which have historically been valued for their beauty and rarity), and faults. In 1992, the U.S. Congress passed the National Geologic Mapping Act (Public Law 102-285). Part of the act states: "Federal agencies, state and local governments, private industry, and the general public depend on the information provided by geologic maps to determine the extent of potential environmental damage before embarking on projects that could lead to preventable, costly environmental problems or litigation." The act also directs that the U.S. Geological Survey establish a geologic database that involves public and private institutions to help promote a better understanding of Earth and how to protect it. Two years later, U.S. President Bill Clinton (1946– ) signed an executive order for the National Spatial Data Infrastructure (NSDI). This order is particularly important because it specifically provides for the establishment of the National Geospatial Data Clearinghouse. This clearinghouse will allow users to search for geologic information. The sharing of geologic information is key to achieving a better understanding of Earth. By studying geologic maps, users can identify such potential natural hazard areas for floods, earthquakes, volcanoes, and landslides. These maps can also provide data on important deposits of energy resources such as oil, natural gas, and coal. How did navigators back then know how the coast looks or how the land is shaped if there were no satellites?